Hobart Bike Kitchen has great pleasure in letting you all know that earlier this month we won a Bicycle Tasmania Clips Award. 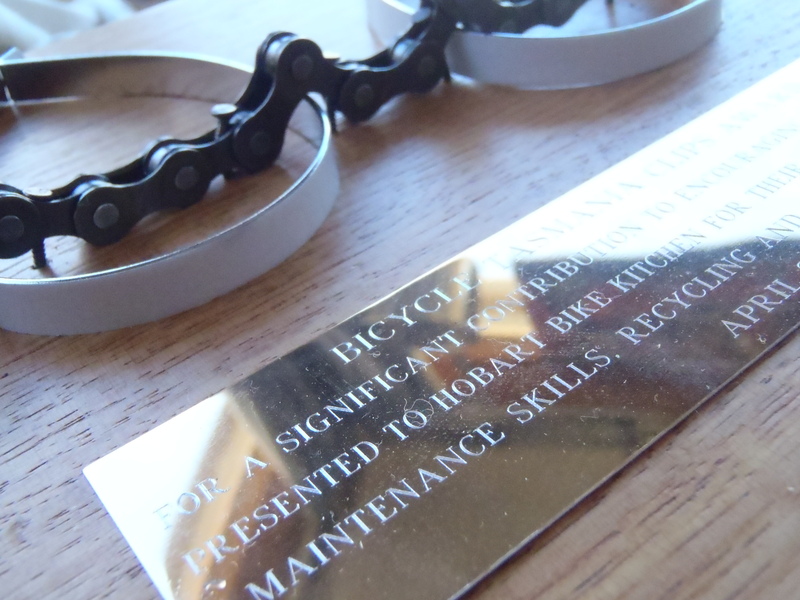 For a significant contribution to encouraging utility cycling presented to Hobart Bike Kitchen for their promotion of bicycle maintenance skills, recycling and sustainable transport. On behalf of Pete, Gus and myself and our growing band (Cheers Ollie, Danny, Lance and all) it has been a great year. “Our aim is to get the whole of Hobart rolling by giving its people access to cheap bikes as well as the tools and knowledge to maintain them. Since then we’ve managed to accumulate lots of bikes and bits, bought some tools, and developed a group of people who are also contributing their time to HBK. We’ve presented at Ride to Work Day and the Sustainable Living Expo & we’ve had a couple of sessions on air with ABC and Edge radio. We have established relationships with the Migrant Resource Centre, Colony 47 & Glenorchy Pulse to work with their groups. We have also been awarded a grant under the Community Capacity Building Grant scheme, so we will be building up a trailer with tools, work stands, bike and bits and be coming to an event near you, or your school etc… . 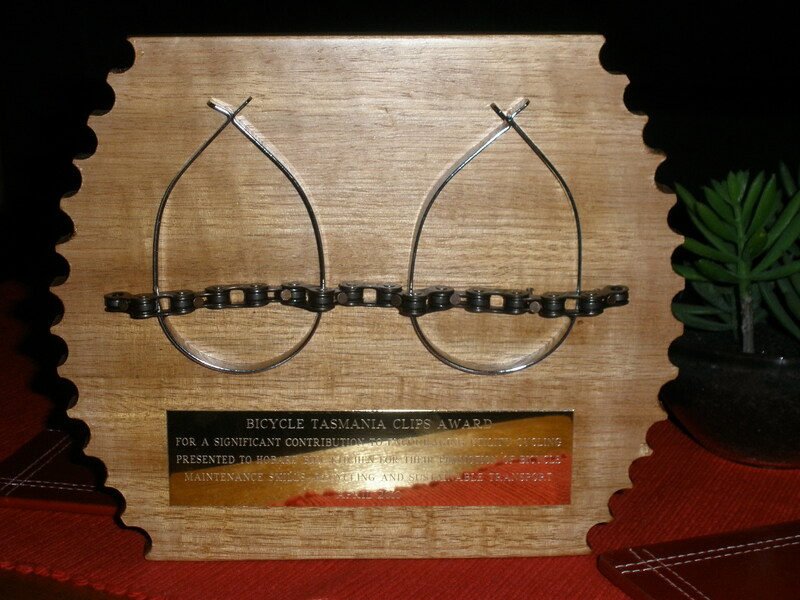 So the Bicycle Tasmania Clips Award marks what has been a really encouraging and fruitful year. For me Hobart Bike Kitchen has been a really good exercise in just getting started and an example of the ease with which connections can be made in our State. The help we’ve had from Healthy Transport Hobart, from Resource Work Cooperative and many individuals has been supportive and generous. So Thanks to everyone who has contributed and here’s to the continuing growth of Hobart Bike Kitchen. I’m waiting for a better photographer than me to provide us with something a bit more dynamic.